In addition to her acting career, Emmy and Golden Globe Award winner Jane Seymour has many creative talents. Jane Seymour is also a painter. 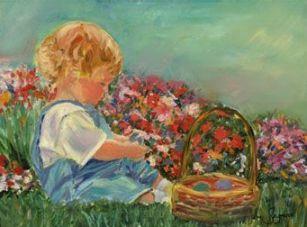 Her artwork consists largely of delicate florals, landscapes, and images of children, in watercolors and oils. The image posted here is "Johnny Easter Eggs" by Jane Seymour. In addition, she is a fashion designer, an author, and has a line of home products, which she sells through her Jane Seymour Home Collection website. Jane Seymour has also written several books, including a novel, a non-fiction work, and children’s books with her husband, actor James Keach. Jane Seymour exhibits her artwork and makes appearances at galleries throughout the U.S. According to her website, the next exhibit of her artwork will be February 1 – 4, 2007, at Simic Galleries in Scottsdale, Arizona. Links to artwork by Jane Seymour and other celebrities at the Pop Life Art homepage.